“Quirks” is a term used to refer to superpowers, and eighty percent of the population has them. If you want to be a superhero, you enroll in the Hero Academy, so that you can be trained and licensed. There are those, however, who have minor Quirks or who do not have powers, but they want to be heroes. They are heroes without legal sanction, and they are called “Vigilantes.” One of these vigilantes is 19-year-old Koichi Haimawari, who has a minor Quirk that allows him to “slide and glide” when he connects his hands and feet to the ground. As My Hero Academia: Vigilantes, Vol. 4 (Chapters 19 to 26) opens, Tsukauchi, the chief manager with the “Captain Celebrity Agency,” has concocted a cross-promotion with Marukane Department Store. It is a roof-top, free concert for the public. Of course, the American superhero, Captain Celebrity, who has moved to Japan, will be the centerpiece. However, Koichi's friend, Pop☆Step, the street performer who uses her “leap” Quirk in her impromptu street performances, will also be showcased, but is she ready for this spotlight? Meanwhile, Knuckleduster confronts Tamao Oguro, a.k.a. “Kuin Hachisuka,” the villainess with the “Queen Bee” Quirk. She is apparently using her army of drone bees to inject people with the Quirk-boosting drug, “Trigger.” There is another dimension to the confrontation between Knuckleduster and Hachisuka that would shock anyone who discovered it. THE LOWDOWN: The My Hero Academia: Vigilantes manga is a treat for me because I am a longtime fan of superhero comic books. So I was delighted when my VIZ Media rep started sending me copies the My Hero Academia manga and it spin-off series, Vigilantes. 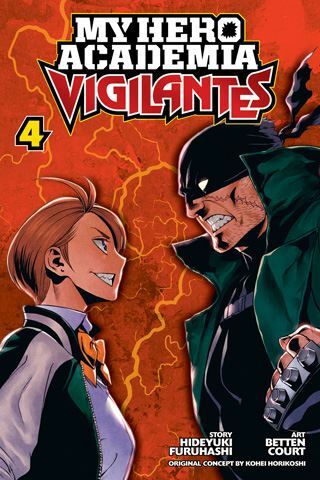 My Hero Academia: Vigilantes Graphic Novel Volume 4 maintains this series steady rhythm of cleverly-composed stories. My Hero Academia creator Kohei Horikoshi has chosen a good creative team for the spinoff. Artist Betten Court and writer Hideyuki Furudashi offer compelling characters and weird, but almost lovable villains. The action and drama always play out with inventiveness and spice, which comes through quite well via Caleb Cook's translation and English adaptation. I am already ready for the next volume. I READS YOU RECOMMENDS: Fans of My Hero Academia, superhero comics, and shonen battle manga will want the Shonen Jump title, My Hero Academia: Vigilantes.